Hi, first of all, overall compared to some AutoX I first experienced on the east coast, I have to say you guys are doing an outstanding job running AutoX! Thank you for great job! 1. Combine classes: Combine some of the adjacent classes, so that there is more in-class competition. Some classes are competitive, but many classes have fewer than 4 entries, so medaling is not as meaningful. Part of the fun over time is friendly competition. The club should probably aim for at least 5 cars per combined class. As a side benefits, it might also reduce the amount of points optimizing and accelerate the awards ceremony at the end. 2. Precise BRI: If you do #1, then you should also change the BRI to be based on the exact car performance points, not the combined class level. It would ensure that if you're bundled into a larger class with faster cars, you still have a chance to excel in the BRI. 3. Paid corner workers: A few years back the club experimented with hiring some automotive engineering students to do corner working. I think that was a cool idea, not just to get out of corner working, but it also felt like doing a nice deed for poor students. Also, if they could become regulars maybe we'd have more consistency in corner working. 4. Increased separation: With fewer cars, we're getting plenty of practice laps. We should increase the separation between cars, even if it means we get 1-2 fewer laps total over the day. When corner working, I still feel less safe than I prefer having to run to pick up cones, hoping someone up-track is watching and has my back. When driving, it would reduce how often I see knocked out cones, and also reduce the need for re-runs. 5. Track layout: The track layouts are generally awesome, but perhaps need to be slightly more cognizant of ruts and dips in the pavement. While corner working sometimes I cringe as I hear the GT3s and other lowered cars scrape the ground at speed, and I can appreciate why they stop coming. 6. Later on-line registration cutoff: I think on-line registration used to close the Wed before the event, whereas now it seems it's a week ahead. It would be great to move it closer to the event again, as close as practical. I know it's a lot of work for the volunteers doing registration, but I suspect this change would enable the late-committers to attend more often. 7. Later tech/check-in/start: We have to be there to tech at by 7:15AM, but don't start driving until 9AM. That is a long gap. With fewer cars, tech shouldn't take as long and we shouldn't need as long a buffer. Waking up while it's still dark is painful for some of us. Pushing back the schedule to cut off tech at 8:15AM would be welcome, even if it means perhaps not starting running until 9:30AM. 8. Penalty for hitting many cones during practice: We should to encourage people not to hit cones even during practice. One way to do it is only cars that were mostly clean get an extra practice run. It doesn't have to be precise, just ballpark. Give us 5-6 practice laps and if you've hit fewer than 1-2 cones total you are invited for an extra practice lap if you like. Or maybe you are alloted an extra timed lap later. 9. Coffee & donuts for everyone in the morning? Since we're all getting up early and skipping breakfast, that could be a nice touch (like Cars & Coffee). Generally for this as well as #3 above, I'd be fine raising the entry fee - I don't think the fee is a big deterrent considering the other costs of participating (like tires, etc.) dwarf the entry fee expense. 10. Friends & family rides: I always felt it was a bummer I couldn't share the experience with my friends/family. I've had the opportunity to drive at Thermal Club, and it's really satisfying to be able to give a friend/girlfriend a thrill ride. I also feel it's a way to introduce people to the sport. Right now you have to be an instructor, but perhaps the requirement could be reduced to not being a student or having a certain experience level. Again, I think you guys are doing an awesome job, and I just wanted to offer some constructive suggestions to make it even better. I see in the December Board Meeting minutes that Keith Verlaque proposed a rule change for non-PCA drivers at AX events, and that the new board subsequently passed it. But there is no indication of what the change is. Can anyone tell us what the change is? 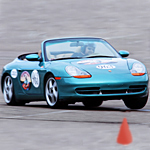 "With the exception of JPP participants, PCA-SDR autocross participation shall be limited to PCA members." The largest and most dedicated group of AX er's in SoCal are the SCCA folks. OCR PCA said their $$$ was green long ago. This is the 1st year for an X class 1st award. Over 90 cars in 11 events last year were X class. My $.02, for me it is strictly the surface. With the old water buffalo, running sticky tires to be somewhat competitive in CC10, I simply could not afford to get a new set of tires twice if not three times a season. The newer cars are heavy and having to shoe them with 18”, 19” and up tires isn’t cheap. The look on a students face after they drive their cars at 7/10’s up is fantastic until we check their tires and they look like a giant cheese grater had its way with it. Elation to horror in a nano second. My attendance fell off because 2,200 miles is a bit far to drive for an event. With regard to being trained in corner-working for one's first event... I was signed off with a check-ride the morning of my first PCA-SDR event. Nobody had any concerns about my safety behind the wheel. However, for somebody who came from SCCA events, corner-working a station solo felt a little bit like drinking from a fire hose that first day. It's not uncommon, depending on how far along the track you are stationed, to have two cars coming by less than ten seconds apart, both at 65-70 MPH. Compared to what I had experienced before, it was intimidating. At the SCCA events I did, there was more emphasis on car spacing, and of course, speeds by design are a little slower. Car spacing is enforced more there because every run is a timed run, and every driver has the right to expect a pristine course without downed cones, so at the same time there was a little more pressure on SCCA corner workers to reset every downed cone before the next car arrives. What I'm saying is that I probably could have used some corner working help/advice that first day. So I approve of anything that helps out in that way. There are a lot of reasons. While the asphalt issue is hard to fix, many other issues could be addressed. If you read between the lines of Russell's and Shawn's posts you will see that some of the issues are sensitive and many will not post them here, including me. The suggestion of an anonymous survey is excellent and should be done. Lots of good input here. The 2 biggies for me are the track surface and the overabundance of classes reducing competition effectively to zero. The most fun I ever had with PCA AX is when we had a dozen closely matched cars in the same class and everyone was within 2 seconds per lap. Drive clean and manage a top three finish or throw one corner and finish DFL. Now that was fun! In order to get there we probably need 15 possible car classes instead of 50. It could be done with a few simple rule changes. Hmmmm. Cajundaddy wrote: It could be done with a few simple rule changes. Hmmmm. Feel free to submit a proposal! sf.in.sd wrote: X-class drivers have traditionally helped with attendance, and many of the regulars who come out month after month in spite of the poor surface- do so in their X cars. I think our elitist policies are keeping the numbers low. BMW club is getting 30-40 X class drivers a month. We have less than 10 and most of those are Legacy club members who never drove a Porsche in their first events as students, as our current rule insists upon. This is a stupid rule and has nothing to do with safety as I know of at least one "student' that was told they could only learn in their 400 hp Porsche and could not use another suitable non-Porsche with less than 200 hp. Ironic- when this forum is filled with the praises of learning to drive in slow cars. Reminds me of when we changed the rules to not allow an X car in the Top 10 because P car drivers didn't like be aced out of the Top 10 by a Miata.